Since we showed you a novel controller from Nubytech that you'll never play, it only seems fair to spend today's Total Recall talking about one you can play. And is way cooler. This is Nubytech's Resident Evil 4 controller, fashioned for the game's release back in 2005. Originally designed only for the GameCube, which the game first appeared on, a version was later released for use with the PlayStation 2 when it turned up on Sony's console nearly a year later. As you'll see in the video and pictures here, the thing was completely impractical, buttons in not just the wrong spot, but uncomfortable spot. If you ever meet someone who says they enjoyed using it, they are either lying or enjoy self-flagellation. But that's not the point. You didn't buy this thing to use for 20 hours a week. 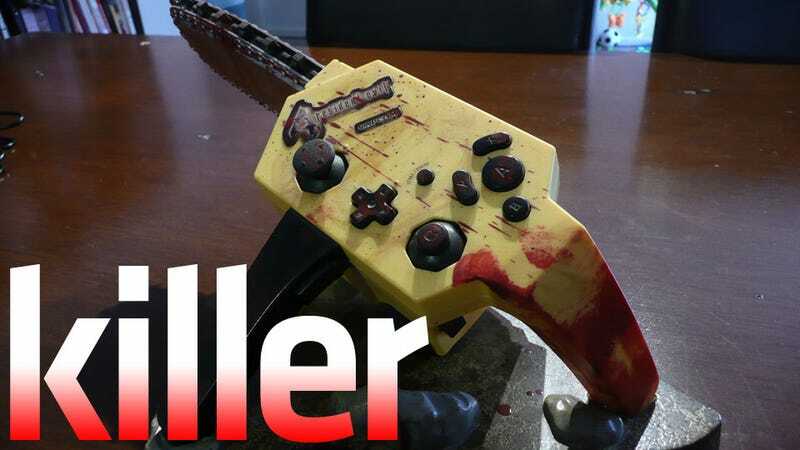 You bought it because it was a chainsaw that was also a game controller, and looked great on your shelf. Unlike most other things we'll ever deal with on Total Recall, the Resident Evil 4 chainsaw controller is - despite the game's age - amazingly still available from certain online retailers, where you'll find the PS2 version is more plentiful than the yellow GameCube model.